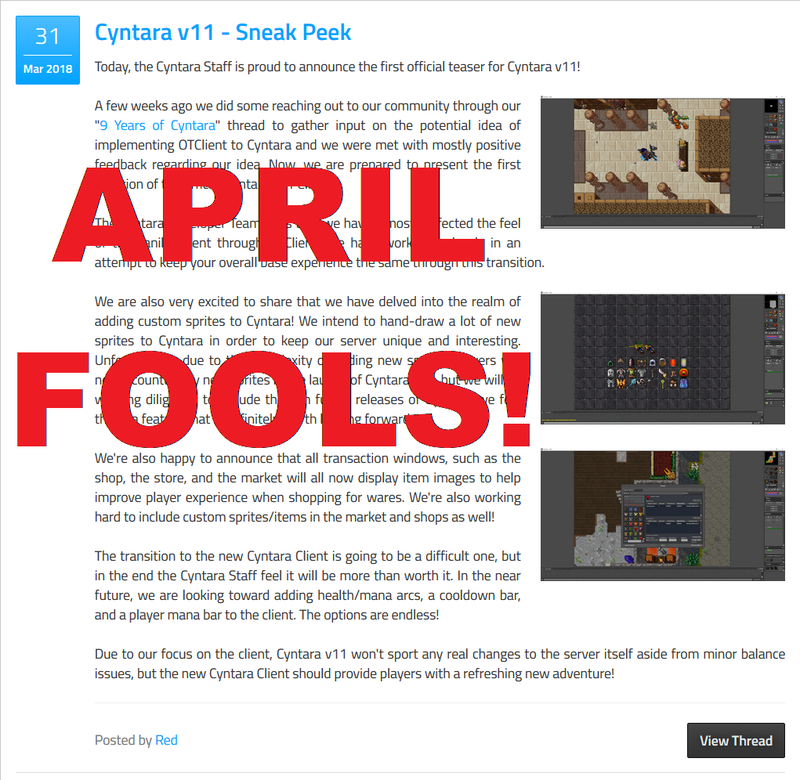 Cyntara - News #13 - Cyntara v11 - S̶n̶e̶a̶k̶ ̶P̶e̶e̶k April Fools! Cyntara v11 - S̶n̶e̶a̶k̶ ̶P̶e̶e̶k April Fools! Well, kind of. The news that we released yesterday was true in regard to the future of the Cyntara Client. We have been working diligently to release a custom client with the release of Cyntara v11. The screenshots provided in yesterday's news piece were intentionally underwhelming, inaccurate, and deliberately altered to make the Cyntara v11 client look outright bad. 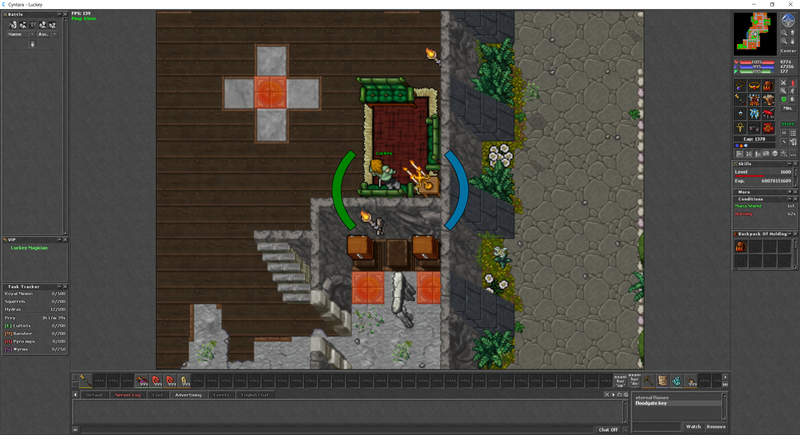 With the release of the Cyntara Client, we do intend to introduce custom sprites, including Retro Outfits. The Cyntara v11 update will bring more than a new client that sports new features - we are planning to release a content update as well. We plan to invite a select number of players to test our Cyntara Client as we come closer to finishing the first version of the client. Next season is slated to begin some time this coming summer. More information regarding the launch date as well as what you can expect from the Cyntara Client as well as the content update will be arriving in the coming weeks; players can expect to see update teasers in a similar fashion to v10-s2. For now, please enjoy an actual screenshot of the Cyntara Client! Happy Easter and April Fools Day! Posted by Red on 04/01/18 12:49 AM.